The assembly in India's Haryana state has passed a bill to provide quotas for the Jat community in government jobs and educational institutes. The government's decision comes after the northern state witnessed violent clashes in February over the issue. At least 25 people died when Jats clashed with security forces and other communities to press for job quotas similar to those given to lower castes. The bill will become law once the state's governor signs it. Correspondents say the governor's approval is a mere formality. Four other caste groups - Jat Sikh, Tyagi, Bishnoi and Ror - have also been included in the bill. Jat leaders say quotas for lower castes put them at a disadvantage in government jobs and at state-run educational institutions. The land-owning Jat community is relatively affluent and has traditionally been seen as upper caste. They are mainly based in Haryana and seven other states in northern India. Comprising 27% of the voters in Haryana and dominating a third of the 90 state assembly seats, they are a politically influential community. Seven of the 10 chief ministers in Haryana have been Jats. In March 2014 the Congress-led national government said it would re-categorise Jats as Other Backward Castes (OBCs), opening the way to government job quotas. But India's Supreme Court ruled in 2015 that the Jats were not a backward community. As jobs have dried up in the private sector and farming incomes have declined, the community has been demanding the reinstatement of their backward caste status to enable them to secure government jobs. 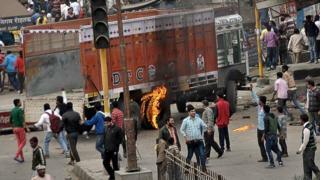 For several days in February, there was unrest in Haryana as protesters from the Jat community set fire to vehicles, shops and buildings belonging to non-Jats. Demonstrations were also held in Delhi, Punjab, Himachal Pradesh and Jammu and Kashmir. Overland transport links to Haryana were brought to a halt by the protests, despite a curfew and the deployment of the army. More than 10 million people in the capital, Delhi, had to go without water after the protesters sabotaged a key canal supplying water to the city. The protests were called off after Jat leaders accepted a government offer. The government's decision to pass the bill on Tuesday is seen as part of the promise it made to Jat leaders in February. Video What future for India's caste system?